Shooting at an amusement park doesn't have to be about going on rides and eating snow cones. So, you're having a pre-session consultation with a high school senior client, and you ask if they have any locations or ideas in mind for their senior session. They say, “I don't know, but I want something “different”. And you're thinking, ok…different how, different than what? I follow a lot of senior groups and boards online, and have been noticing this as a common theme lately. Photographers are struggling to find new locations to take their seniors…or perhaps they are just struggling to find new ways to photograph their seniors in the same old locations. Today I'm going to provide a few location ideas for unique and different senior portraits, as well as a few bonus tips for making the same old locations feel new again. Before we get started though, I would highly recommend doing a pre-session consultation with your seniors. Perhaps you're already doing this, but if you're not, it's a really good way to find out a little bit more about your client – what he or she is into, what they do for fun, what they want to do after high school, etc. You might be surprised by what you find out during this meeting that can help give you ideas on how and where to approach their session. Say you find out that your client has dreams of learning to fly; perhaps you can work with a small airplane owner who will let you take photos in front of their plane at the airport or in the hangar. Or perhaps you've got a girl who lives for being on the water, wakesurfing and paddleboarding; see if she wants to do a few photos on the water while she's doing her “thing”. Making sessions personal will help reduce the need for trying to find something different than everyone else has done. If their session is tailored to them, the “different” factor won't come up as often. Meeting with most seniors ahead of time will help you get session ideas, but once in a while you need a little inspiration to draw from. Hopefully this list will spark some ideas to try something new, and get your creative juices flowing. One of my seniors this year is a writer, book lover, and just happens to work in a coffee shop. 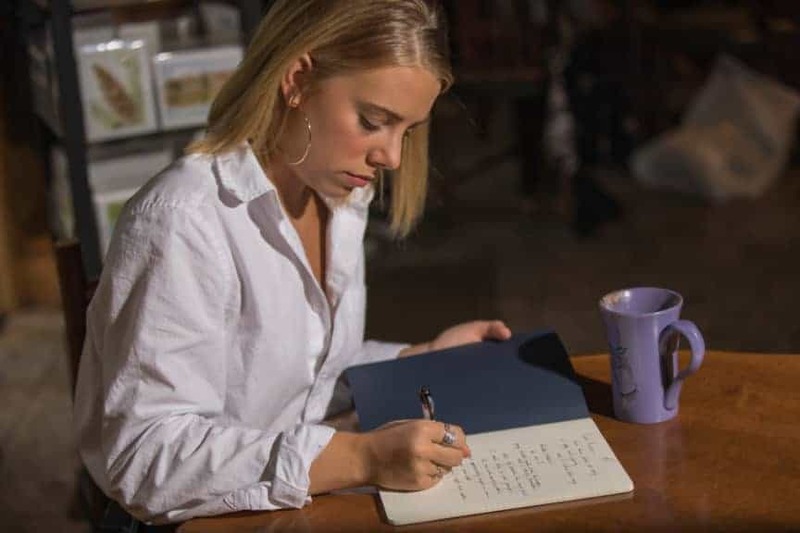 We photographed her among the books in her favorite bookstore, as well as writing in her journal with a cup of hot chocolate at the coffee shop. Each client is unique, and one of benefits of being a portrait photographer is getting to infuse their personality into their senior photo experience. New City – shoot in a different city – it's amazing what you will find in different cities. From different doorways and alleyways to parks, ponds, and bridges, just having a change of scenery can get your creative juices flowing again. Boat– many of us shoot with water as a backdrop, but how about shooting from the water on a boat? Perhaps your senior is into wakesurfing or paddleboarding. Get a responsible adult to take you out on a boat and capture them in their element. Or perhaps you shoot your client IN the water. I've seen some amazing work this year with clients in the water, and I've got some ideas brewing for next year. Biking – mountain biking is a huge activity in many places around the world. Whether your subject is into it or not, going to a location where mountain biking is done is can provide some new and interesting backdrops. In my area, the mountain biking trails run through an old mining area with beautiful red dirt and incredible views. Standing still in a moving crowd – if you live in an area with heavy foot traffic, this might be fun to do. Of course, keep in mind that you may get jostled, nudged, or even pushed if it's a really high traffic area. Furniture Store – I think this is an amazing idea, and one I want to try. Just think about all the different settings you can have within one location. If you're looking for a lifestyle vibe for your shoot, this could be a great opportunity. Shooting Range – if your senior is into archery or shooting, getting permission to shoot photos of them at the range would be a fun and unique experience. Greenhouse/Botanical Gardens – many communities have arboretums or botanical gardens that are beautiful places to photograph. Carnival/Amusement Park – Shooting in a carnival or amusement park doesn't have to be about carnival rides and cotton candy, as much as it is about colors and textures. The bright and bold colors found in an amusement park can be just the difference you need to put a different feel on your photos. 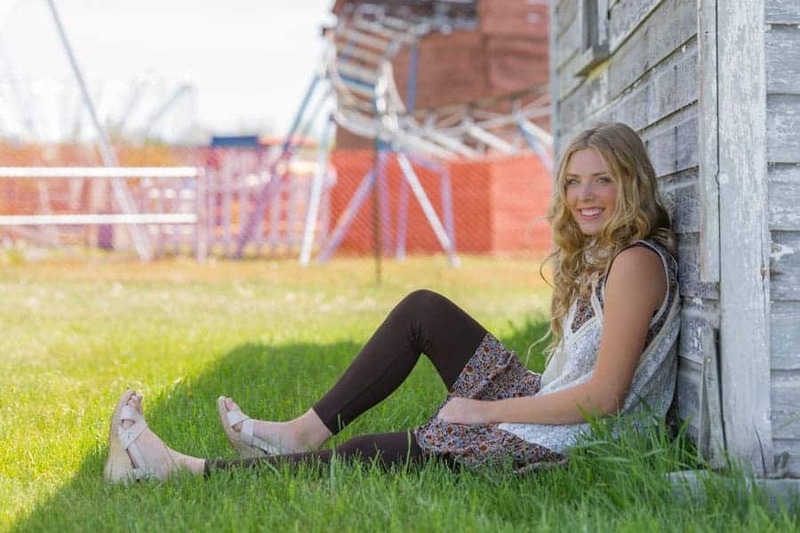 Zoo – is your senior an animal lover? Contact a local zoo, kennel, or shelter, and see if you can shoot photos of them feeding the giraffe, playing with kittens, or snuggling with a puppy. 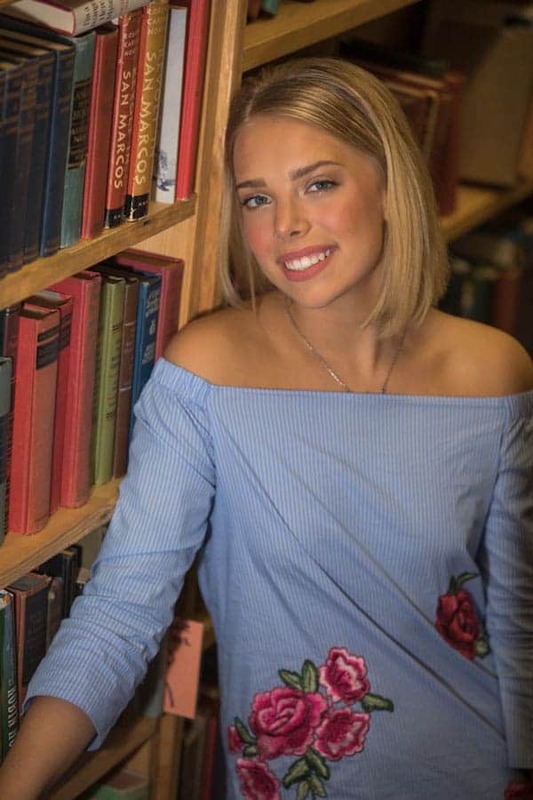 Bookstore/Library – if your senior is a bookworm or writer, taking their photos among the rows of books may be right up their alley. 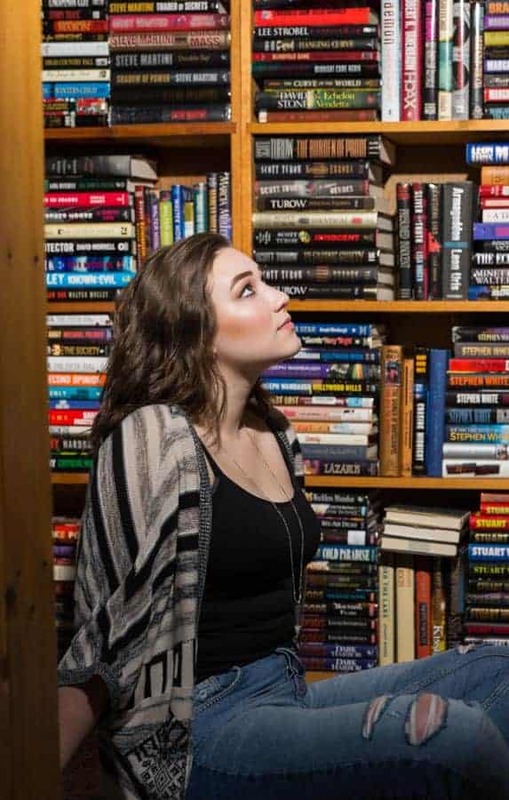 When books are your passion, why wouldn't you take your senior photos in a bookstore? 50's Diner – if you've got a senior who loves the classic looks, jeans and a white t-shirt or classic dresses with bright red lipstick, there are lots of possibilities here. Vineyard – whether you're envisioning a client among the vines in a long flowing dress, looking out over the rolling fields, or shooting a closeup picking grapes, there are many possibilities here. Outdoor Sculpture Garden – many communities have large outdoor sculpture gardens, and depending on subject matter, shooting there may be the right fit for your senior. Theatre – have a senior that's into theatre, or maybe just loves going to the movies? Getting access to photograph them in a local school auditorium may be just the difference they are looking for. Historical Society/Pioneer Village – there may be different names for them, but if you can find a place in your community where history is preserved in the form of old buildings and equipment, you will likely find an interesting place to shoot. Whether it's the texture and colors of the old buildings or equipment, you're sure to find something unique. Coffee Shop – whether your senior is the one making the espressos or the one drinking them (or both), coffee shops can provide a great backdrop, even if it's not all about the coffee. Perhaps your senior likes to read there, write, or just do homework. If it offers a glimpse into their everyday life, it's worth pursuing. Writing is her passion, and photographing her doing it in the coffee shop where she works helps tell her story. Airplanes – have a senior that is an aspiring pilot? Have them talk to their local airport FBO and see if they can shoot some photos onsite with one of their training airplanes. Cars/ Trucks – perhaps your senior is into classic cars or spends all their free time working on their own. Adding the car into their photos will represent who they are, and give them photos they'll cherish. Restaurant – maybe they work at the restaurant and love it, or they just love the atmosphere there; it might be a great place to shoot. Laundromat – I've seen a lot of fun, retro photos from shoots a laundromats. It's a fun throwback, and if you've got a senior who loves the retro vibe, it might be right up their alley. Ice Cream Parlor – have a senior who lives for ice cream? See if you can shoot in their favorite ice cream shop. Junkyard – you'd be surprised at all of the interesting, grungy things you can find in a junkyard if you're willing to explore. I would recommend scouting the location ahead of time, but you might find some treasures that no one else will have in their photos. Racetrack – if your senior is into NASCAR, drag racing, or other motorsports, see if you can find a local track that is willing to let you come out and take photos. College Campus – many college campuses have beautiful architecture and interesting courtyards. If you've got one nearby, check it out as a potential location. Parking Garage – I have seen many amazing portraits shot in parking garages, so if you're in the big city and you haven't tried this, it might be time. Shooting on location is fun and exciting, but please remember to get permission if needed. As photographers, we are all in this together, and when one of us is disrespectful, it can ruin it for the rest of us. I've never had anyone refuse when I've asked, but if they do, please be respectful and find another location. Finding access to unique locations to shoot is a privilege, and if we want to continue having it, we need to be respectful before, during, and after the session. Now that we've talked about ideas for some different locations, how about a few bonus ideas for changing things up in familiar locations? Sometimes the way we shoot can switch things up just enough to provide that “different” look the clients are asking for. Get High – Bring a stool with you to get up higher than your subject. Having a different perspective can create some interesting images. Get Low – I'm not above getting down on the ground on my belly to get the shot if that's what it takes. Color bombs – I haven't personally used these, but have seen some interesting images from people who have. Get in the Water – You might want to consider getting in the water yourself to get the shot, but I am mostly referring to having your clients get in the water. Of course, I would recommend this as the last shots of the day, but I've seen some incredible images with senior girls laying in shallow water with a beautiful dress flowing around them. It's actually on my list of things to do for next season. Shoot in different lighting conditions – if you're typically a golden hour shooter, try a different time of the day or use off camera flash if you're typically a natural light shooter. Switching things up can get your creative juices flowing and get you out of your comfort zone. Shoot with a completely different lens – if you normally use your 70-200mm, pull out another lens and use it exclusively for a location, or a portion of the shoot. You might find that you love what you create. Different perspectives – bring a ladder or step stool to get up high and shoot down on your subject, or get down on the ground with them. Shooting from above is very flattering for women, and shooting up from below makes guys appear bigger and tougher than they may really be. Get artsy and creative with your shots, whatever that means to you, but try things you normally wouldn't do and see what happens. If you're hesitant about trying new things, and don't want to experiment on paying clients (good plan! ), find a model to work with. It's always a good idea to have a little experience under your belt before you try new things on your paying clients. Or, if you do try new ideas on your clients, just make sure you don't change everything up at once. You want to make sure you've got enough “safe” shots in the bag just in case your new ideas don't pan out. While some of these ideas may not be new to you, hopefully there's something here that you can use to bring “different” into your senior sessions. At minimum, I hope these ideas have given you a little inspiration and got you thinking about other ways to do senior portraits differently. And if you've got any “different” ideas to share, please share them in the comments below. Thanks! Deb is a portrait photographer, specializing in senior portraiture in the beautiful Brainerd Lakes Area of Minnesota. With a full time career in the automotive industry and a part time photography business, "I'll sleep when I'm dead" is her motto. When not busy working on some project at home, she and her husband enjoy traveling and exploring the great outdoors. Find out more about Deb and her photography on her blog at dmitzphoto.com, her website at debmitzelphotography.com, or follow her on Facebook and Instagram.